club, and its current and former players. Antonio Mikaele Tu'u and Tyler Campbell. Photos: Supplied. 19/04/18 | The University of Waikato Rugby Club are proud to announce that Antonio Mikaele-Tu’u and Tyler Campbell have been chosen to represent New Zealand Universities on their tour of Asia. The team will play three matches in Japan and one match in Singapore against their national rugby team. Antonio, from Hastings (originally Wellington), and Tyler, from Southport, Australia (originally West Auckland) are both in their third season with University, with Antonio playing in the midfield or on the wing, and Tyler, a versatile back, comfortable at fullback or first five and on the wing. The boys were selected on their strong showing in the pre-season game against the University of Auckland, with Tyler also having ITM Cup experience during Waikato’s 2017 campaign. Selection in the NZ Universities side is a prestigious honour, with numerous past representatives going on to play for professional rugby teams both in New Zealand and abroad. Antonio and Tyler will bring back with them valuable overseas experience to share with their Premier teammates back in New Zealand. In the last 5 years, Japanese rugby has gone from strength to strength, and the sides the team are expected to face are not to be underestimated. Visiting New Zealand rugby teams are well respected and the Japanese are expected to be stern competition. From all your University Rugby family, congratulations on your selection and all the best for the tour! Damien McKenzie playing for the Chiefs in 2017. Photo: Unknown. Stacey Waaka makes her getaway against Auckland. Photo: Zimbio. 6/2/18 | All Blacks, Chiefs and former University utility back Damian McKenzie took home the gong for Sportsman of the Year at the Brian Perry Regional Sports Awards held in late January. McKenzie shook off stiff competition from fellow All Black, Tawera Kerr-Barlow, Black Cap Mitch Santner and New Zealand cyclists Sam Gaze and Dylan Kennett. 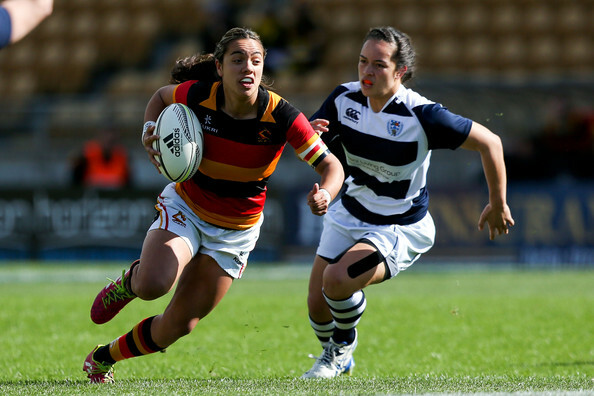 Other finalists from the University of Waikato Rugby Club were Black Ferns Sevens players Cheyelle Robins-Reti in the Emerging Talent category and Stacey Waaka, in the Sportswoman of the Year category. Both Cheyelle and Stacey lost out to fellow union players, Luke Jacobsen and Toka Natua. Natua, a Black Fern teammate of Waaka's also went on to win the night's top award, Sportsperson of the Year. Congratulations to Damien on your win, and to Cheyelle and Stacey for such a successful 2017! For a full wrap up and list of regional winners, see here. For a complete list of finalists, see here. 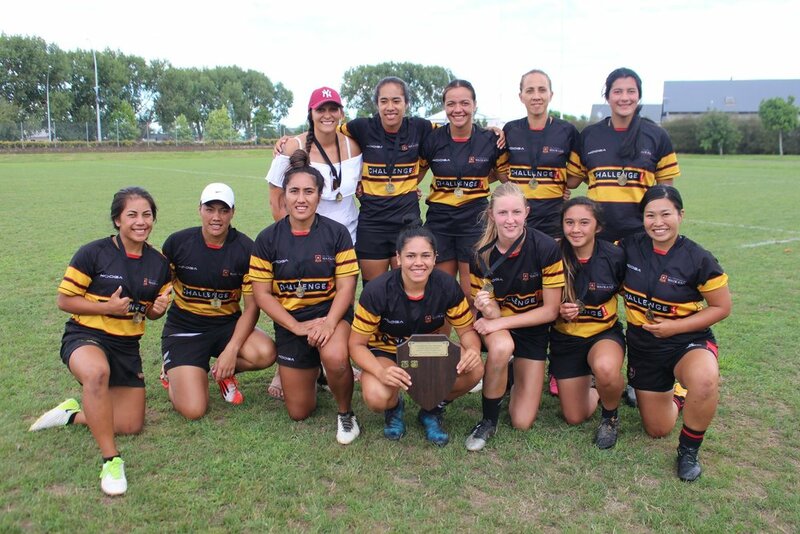 6/2/18 | The University Womens Sevens team have proven they're a force to be reckoned with after securing the Women's Tertiary Sevens title at the tournament held to coincide with the inaugural Hamilton Sevens over Waitangi weekend. Congratulations Andy, Victoria & Natalie! The Don, Gate 3b, Silverdale Road. Congratulations to Damian McKenzie who has been called into the All Blacks squad as an injury replacement for Ben Smith. Smith suffered a concussion in the All Blacks 30-15 win over the British & Irish Lions in the first test at Eden Park last night. Smith, who has been plagued with concussion problems for most of the 2017 season, suffered another knock in the 27th minute of the game and did not return to the field. Smith wasn't the only injury in the game, with midfielder Ryan Crotty pulling a hamstring in the 33rd minute. This meant an earlier than expected entry to the game for Anton Lienert-Brown, who joined Sonny Bill Williams in the All Blacks midfield. McKenzie, who has already faced the Lions as part of the Maori All Blacks side, is likely to make the bench for the second test, with his ability to cover both first-five and fullback. The Varsity Womens Team after their 93-0 victory over Southern United in the semi-final. After going unbeaten through the regular season, Varsity Women fell at the final hurdle in the WRU Womens Cup Final, going down 19-10 to Hamilton Old Boys. Playing on their home turf, favourites Varsity started strongly, with an unconverted try to prop Kate Anderson within the first six minutes of the game. Varsity extended its lead to 10 points, with another unconverted try to fellow front rower, Natalie Delamare. That completed the scoring for the first half and Varsity went into the break 10 nil up. Hamilton Old Boys made a spirited come back in the second half, narrowing Varsity's lead with an unconverted try to centre Donna Fermanis. With 20 minutes left on the clock, Old Boys winger Veronica Sue crossed over for a try, drawing the scores level. Sue's try was converted by Ari Bayler, giving Old Boys the lead for the first time in the match. Sustained pressure saw Fermanis dot down again, and Bayley convert, extending Hamilton Old Boys lead, and effectively sealing the match. Varsity were without four key squad members for the match who were unavailable after being selected for the Black Ferns side to face England. Coach Kelly Westgate indicated this, in addition to the depth of the Old Boys squad was the key difference on the day. "I thought we were the fitter side but we only had three reserves and by the end of the game I think they [Old Boys] just managed to stay fresher." Congratulations to Hamilton Old Boys on your title, and to our girls on a brilliant season. Bring on 2018! A trio of varsity players have made the All Blacks and Maori All Blacks sides to face the British & Irish Lions during their once-in-twelve-years tour of New Zealand. Anton Lienert-Brown joins Ryan Crotty, Sonny Bill Williams, and newcomer Ngani Laumape in the All Blacks midfield, while midfielder Charlie Ngatai and fullback Damian McKenzie have both made the Maori All Blacks side. Lienert-Brown will be keen to add to his 9 caps in the black jersey where he has looked at home since being called into the All Blacks squad for the 2016 Investec Rugby Championship as an injury replacement. He’ll likely face Kiwi-born English back Ben Te’o and Welshman Jonathan Davies if selected as a starter in the three tests, the first of which is played at Eden Park on June 24. After turning out for Varsity on a handful of occasions this season, Charlie Ngatai also makes a welcome return to representative rugby. Ongoing concussion issues have marred Ngatai’s abililty to progress his game and regain the form which saw him named in the All Blacks squad for the historic test against Samoa in Apia in 2015. Being named in the Maori All Blacks side will give him the opportunity to show his wares in a test like environment, and push his case for an All Blacks berth. In the meantime, Ngatai will bring much needed experience to the Maori team, with only teammates Ben May, Tim Bateman and Liam Messam having turned out for the side on more occasions. McKenzie is unfortunate to miss out on a place in the All Blacks side after yet another strong showing for the Chiefs this season. Instead, the diminutive playmaker will get the opportunity to face any number of the world-class international fullbacks that Warren Gatland has at his disposal - Wales’ Leigh Halfpenny and Liam Williams, and Scotland’s Stuart Hogg. Dotting down against Hamilton Old Boys earlier in the season. Photo: Waikato Womens Rugby Facebook page. Our Varsity Womens team have stormed into the semi-finals for the 2017 season, winning all of their round-robin games. The women have played a balanced style of rugby, amassing a staggering 444 points for, while only conceding 30 points so far this season. On four occasions, Varsity's opponents have been unable to score against them. The team takes on Southern United this Sunday 11 June at 1pm for a spot in the final. If you're around the University grounds, make sure you head on down and support our ladies! Former Varsity player and 2016 Waikato Mitre 10 Cup captain Whetu Douglas will be heading overseas at the end of May after signing with Treviso for the 2017/18 season. Whetu Douglas called into the Crusaders as injury cover for All Black captain Kieran Read. Photo: Zimbio. Douglas, 26, confirmed a deal with Italian club Treviso which will begin in June. Douglas has recently completed a stint with the Crusaders where he was called in as late injury cover for All Blacks Captain Kieran Read. The Maori All Black who went on last year’s Northern Tour will link up with former All Black and coach of Treviso, Kieran Crowley, who took over as the head coach last season after stepping down as Canada’s national coach. “It was a hard decision to leave Waikato and New Zealand Rugby. This opportunity will allow me to be a full-time professional rugby player, and to look after my young family.” Douglas said. Varsity wishes Whetu and his family all the best on their Italian adventure. Two University senior players from the mid-late 1960s have recently passed away. Murray Ball in 2007. Photo: Setford news photo agency via Radio NZ. Murray Ball, of Footrot Flats fame, spent some of his early years in South Africa before returning to New Zealand in time to represent the New Zealand Juniors against the 1959 British Lions. Ball played senior rugby for Waikato University in 1965, alongside Kevin Bradley, Trevor Kilpin, Barry Hill, John Meade and others. Unfortunately Murray was one of several players absent from the team photo that year. Murray died in Gisborne on 12 March 2017. Ken McOnie attended Hamilton Teachers’ College in the mid-1960s. He was a most competent tight forward in the Waikato University senior teams for several seasons, with team mates including the likes of Sharkey Davies, Bob Blake, Lachie Tinkler, Steve Brooker, Peter Grayson, Owen Keightley and Kevin Bradley! Ken is the father of The Crowd Goes Wild TV presenter James McOnie. Ken died at Waikato Hospital on 15 February 2017. University of Waikato Rugby Club wishes to extend its condolences to the family and friends of both men. Laurie McGlone at the Cornish Pirates. Photo: Cornish Pirates. The Club welcomes Laurie McGlone to Varsity as coach of the Colts team (with Aaron Rivers) this season. Laurie enjoyed a most successful decade of professional rugby overseas, playing for Gran Parma in Italy (2006-07), Coventry (2007-2009) and Cornish Pirates from 2009. Before departing overseas, Laurie played six seasons for Marlborough and Tasman Makos in the NPC. He attended the University of Otago from 1997-2001 during which he gained a Bachelor of Land Surveying degree. He has an England Rugby Union coaching certificate and coached age group teams while in England.